That time of the MJ month again. Little late this month, gave me a scare... ;) Nah, all my fault. My apologies to this month's member for the short notice. Truckin' on though. Guys feast your peepers on this. 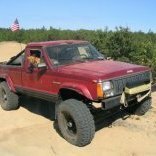 1989 Jeep Comanche Pioneer, LWB 4x4 with the Metric Ton package. From the factory it came with the I6, BA10 transmission, NP231 transfer case, front D30, and a Rear D44 with Trac-Loc. Still running the stock 4.0L with a late model valve cover and upgraded Fuel Injectors. Upgraded to an external slave AX15 transmission after the BA10 slave cylinder gave out. The front D30 was replaced with a new front D44 axle with 30 spline shafts. Added Eaton E-lockers F&R, and 4:56 gears, sealed up with Rock Crusher 44 Rear Diff Covers. I stuck with the closed system, but added a Macs Aluminum replacement “Turtle” and a Napa overflow bottle. Stock Renix electrical system = all sorts of fun. I eventually added dedicated ground & power points to help with the never ending electrical issues. Upgraded Headlight Wiring Harness to accept H4 E-code headlights and have modified the side marker lights. GC V8 Sway Bar & 97 ZJ V8 steering upgrade (drag link & tie rod). My favorite ~ the dark blue interior with XJ seats mounted on factory MJ bucket seat brackets. New headliner & XJ vanity mirrors that recovered by myself. Already had the full gage cluster, but added a tilt steering column out of a 1989 XJ with an automatic transmission. Replace the steering wheel with a Grant steering wheel and changed out the horn button with one that says Jeep. Installed a Sony stereo and a few speakers to help drowned out mechanical issues & tire howl. I substituted the stock mini shifter console with a full center console out of a XJ. Replace old carpet and added Husky Liners. Replaced door seals with 1998 XJ seal for the better Noise, Vibration, and Harshness (NVH) ratings. The jeep already had the rear sliding window. Rear Brakes: Stock Dana44 with ZJ disc brakes waiting to go on. My best story is that I actually got nominated. You are one of my biggest inspirations for a nice looking lifted longbed. Your build page, an epic collection of projects, help, tips, and a metamorphosis from what was to what is today. Always willing to go out of your way to save an MJ, or track down that weird part. What you have brewing with the dually MJ is something to be envied. Yet another one of the threads that I have bookmarked. You are a longstanding member of our little part of the world, and a hell of a guy. Another member who makes our job as MJOTM deciding committee easy. Bask in the sunlight, and enjoy your MJOTM. Hey Rich, congratulations! Well deserved. Your knowledge is great, but your willingness to share it is greater. Please keep up the good work and I always look forward to your updates. Can't wait to see your mjs in person someday. Thanks for giving me a little more time Automan2164. 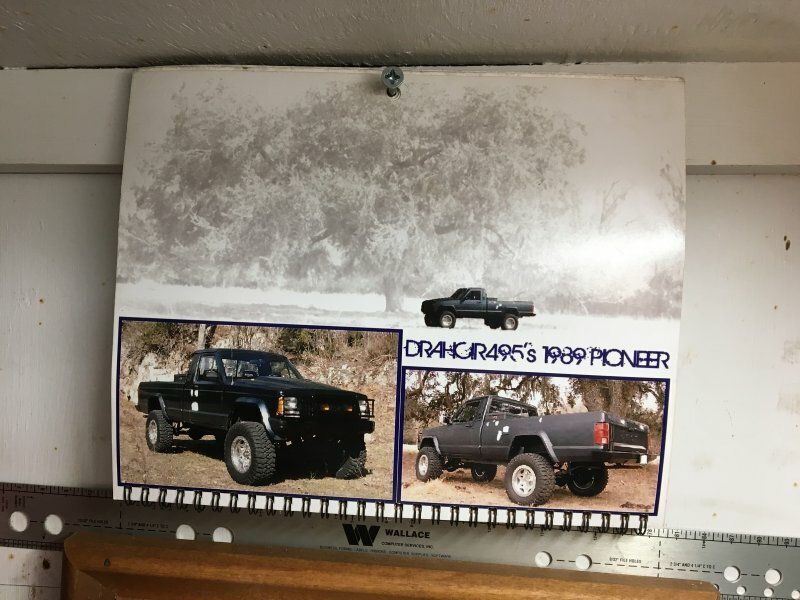 Thank you to everyone behind the scenes that thought my jeep was good enough to be included in the Comanche of the Month ranks :cheers: . Buxmj - kind words ~ thank you. Pete - thank you for starting this great site, so :bowdown: right back-atcha! Congrats Rich - Well deserved & long overdue! Brandon - you are a good guy too. Thank you. $500 MJ - I appreciate that :thumbsup: . probably my favorite LWB MJ on the site. well deserved. Congrats Rich. Very well deserved and a great example of a well done lwb.